Gloria's mini exhibit of art created by Gloria Poole,RN,artist of Missouri and Georgia: Charcoal drawing of pond drawn by me Gloria Poole,RN, artist of Missouri, USA. 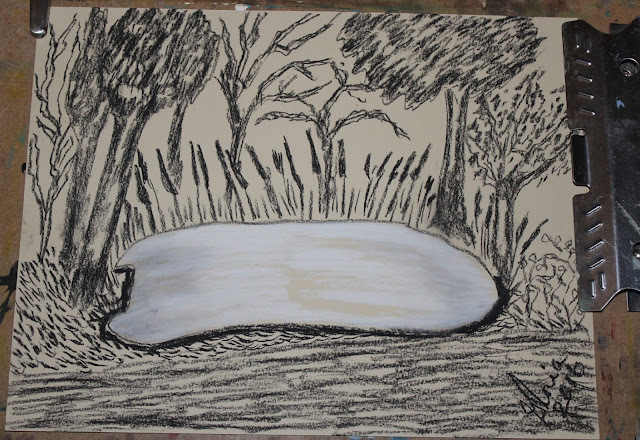 Charcoal drawing of pond drawn by me Gloria Poole,RN, artist of Missouri, USA. I , Gloria Poole, drew this with a stick of charcoal and I used tinted white charcoal pencil for the "pond". I drew it on tinted cardstock paper. I was trying to imitate a technique I saw over the weekend in a tweet to me. I used to draw with charcoal more but in past few years have not used charcoal much because it is not very precise and cannot be sharpened to a point. Well, in pencils it can be sharpened but in regular charcoal, it cannot be sharpened. I don't think I precisely got the "pond" correct. But a sketch is a learning tool always and therefore it is not usually "perfect". I make sketches in many mediums and when I first began to paint I even painted sketches in oil onto canvas-like paper specifically for oils. Now I only paint with oils from a tube on canvases. I do sometimes create oil pastels on paper when the subject demands a lot of texture. I signed this in charcoal also in the lower right corner. I photographed it more than once and uploaded it, and posted it to this blog of mine today 11th April 2016 at 6:43am. Copyrighted, and I, gloriapoole / Gloria Poole / Gloria own all rights to this blog collectively as a whole unit and individually as posts or art. I photographed this on one of my portable drawing boards. Also, thank you very much to viewers/ readers of previous blog post in US, Canada, Germany, Singapore, Russia, Poland, Ukraine, and South Africa. I appreciate it very much. Also, see the list of 43 countries & city states that view or read my blogs [different blogs at different times I suppose depending on title?] that I posted to my https://artist-gloriapoole.blogspot.com and also my https://gloriapoole.blogspot.com. https://tapestry-of-life-LLP.blogspot.comTapestry of LIFE updated by me Gloria on 8th April with scriptures about healing. https://gloriapoole.blogspot.comUpdated by me Gloria on 10th April with cartoon I drew 'the serpent seized the ball"
http://gloriapoole-UK.livejournal.comUpdated by me Gloria on 6th April with acrylic sketch I painted "random objects"
https://publishing-life.blogspot.comPublishing LIFE updated by me Gloria on 31st March with medical lesson "From embryo to fetus"
https://gloria0817.blogspot.comUpdated by me Gloria on 1st April with 2 drawings of silver on purple background to create "stylized butterflies"
https://gloriapoole.wordpress.comUpdated by me Gloria on 1st April w/ sketch I drew of tropical fish coming to the air. https://artist-gloriapoole.blogspot.comUpdated by me Gloria on 10th April with cartoon I created "angel with purple wings"